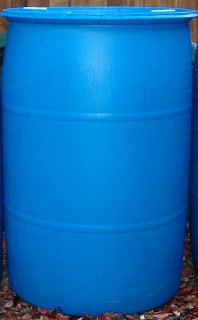 There's been a lot of talk about rain barrels and what is and what isn't a good idea for them. Most of what I read these days seems to be about how to make them atractive in your yard. If you are so worried about how it looks that you never get around to actually getting any then you've already missed the point. Personally I think if you have the chance to get rain barrels then you can worry about where to put them and how to decorate them later. Right now the rainy season is starting and it's the perfect time to figure out placement of the barrels and of the collection point. If you have rain gutters then using an existing down spout is perfect. If there isn't a convenient one then you might have to divert the gutters elsewhere. At my house there is a definite collection point that I can't move since it captures over half of the water that hits my roof and currently doesn't have a gutter. It's nearly in the middle of my back yard but that's just where it has to be since moving it down near the fence would block the entry to the yard off from the side of the house. I have obtained three 55 gallon plastic drums that can be connected, and were last year before cleaning the yard for the winter, by hoses. It will be nice this summer when we need a constant source of water to keep things alive and don't want to run up the water bill or waste city water. The garden will need much more than that really, last year about 500 gallons a month were used (about 16 gallons a day for all of the planting beds) and didn't keep up with the heat as well as I would have liked, but at least it helps. If you need barrels you can get them at many stores these days or if you are cheap then you can contact car washes and usually get the old wax and soap barrels for free. This method is not very reliable though and often takes a long time. This is probably what I will do though for another 5-8 barrels rather than paying several hundred dollars for them. On top of that I really need a consistant regimine of ice watering. This not only keeps water coming but cools the ground so there is less evaporation. The coller ground also helps keep things lilke lettuce from bolting too soon. It's February and the wife has already picked out what she wants to plant for the spring. First off though we need to prep the beds and get them ready for growing which sounds like a couple weekends of work. The three beds in the back really need more sun and so I'm planning on finally getting rid of the youngish pecan tree in the back that's monopolizing all of the sun. That also means summerizing the mirrors so we don't have too much sun bouncing back into the house or garden. The pecan tree used to shade them so I didn't have to mess with them before. Borage - We grew these years ago and they come up pretty well. Carrots - Another easy grower. Maybe we'll get normal sized carrots this time. Leeks - Last time we tried leeks we just planted the bottoms of the ones from the store, didn't do so well. We'll see if seed leeks are any better. Onions - I don't know if we're doing starters or seeds but either way should work well. Celery - Another one we tried to root from the market recently. It's still green but no roots have formed yet. We're going to try this one from seed too. Beet - We've done really well with beets and i don't expect this coming year to be any different. Cucumber - As long as we keep these watered well all through the summer they'll be fine. Past that she wants some flowers. If our lemon grass doesn't make it through the season we're probably getting one of those too.